The TI-5128 continued a revolutionary concept introduced with the TI-2800 Paperless Printer and the TI-5038: The paperless printer! The calculator works like the known printing desktops e.g. the TI-5130. All calculations are done on the main display. Instead the usual printout on a paper the results are scrolled through a secondary display with 4 lines. A maximum of 99 lines could be stored and scrolled up and down with the arrow keys. With the shift of the production from Taiwan to Malaysia the TI-5128 got a new name and new colors. Don't miss the TI-5048. 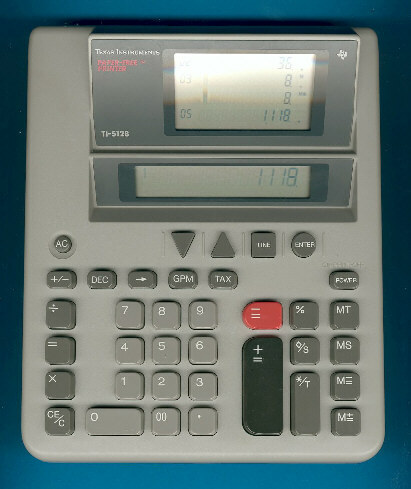 Later similar calculators with smaller housings like the TI-5028 appeared. Don't miss the PS-5400 Translator using the same TMP0211 microcomputer with an external ROM.